[S185] Property Titles. ; PROV (Public Records Office Victoria), C/T 5054-759 - Frederick Henry Amsing of Hampton Park Poultry Farmer. [S66] Berwick Shire Rates, 1870-1965 From 7 Jul 1957, bought for £1,255. Edward Bernard Dineley was 18 and an engineer when he enlisted on 22 Mar 1916. SERN 1151. At the beginning of 1916 there was active recruitment going on, and many towns formed committees to encourage the young men to join. Edward was listed in the newspaper as being one of the Upper Beaconsfield lads who heeded the call, although he lived at Beaconsfield. He embarked from Melbourne on board HMAT 54 Runic on 20 Jun 1916 with the 38th Battalion, C Company. There were 3 more lads from Upper Beaconsfield on the same ship, Stanley Donovan, Claud Harris and Lionel Smith. He served on the Western Front and was promoted to Lance Corporal on 28 Mar 1917. He received a gunshot wound to his abdomen on 20 Sep 1917 and died of his wounds a day later on 21 Sep 1917; he is buried at Lijssenthoek, Belgium. [S35] Probate Records, PROV (Public Records Office Victoria), VPRS 28/P4, unit 3513; VPRS 7591/P3, unit 596. [S80] Ancestry - Family Tree, C.Martin Family Tree. [S185] Property Titles. ; PROV (Public Records Office Victoria), C/T 7229-642 - Henry George Martin of Cavanagh Street Cheltenham Florist (two equal undivided third parts), Mervyn Jack Martin and Arthur Henry Martin - C/T 7229-643 - C/T 7966-028. [S185] Property Titles. ; PROV (Public Records Office Victoria), C/T 7229-642 + C/T 7229-643 - unclear what the transaction on C/T 7229-643 were (title missing), but Henry George Martin of Cavanagh Street Cheltenham Florist ends up with C/T 7966-028 two equal undivided third parts and C/T 8078-303 one equal undivided third part. [S185] Property Titles. ; PROV (Public Records Office Victoria), C/T 7312-249 - Transfer as to part to Henry George Martin - C/T 8076-846. [S185] Property Titles. 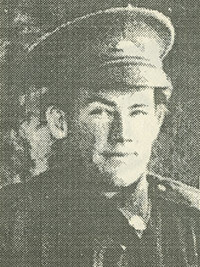 ; PROV (Public Records Office Victoria), C/T 1123-451 - Henry George Martin of Caversham Heights Pakenham Farmer. [S185] Property Titles. ; PROV (Public Records Office Victoria), C/T 7966-028 - C/T 8529-550 - William Lakelin Toolmaker and Victor Colin Lakelin Clerk both of 9 Glenview Avenue Malvern - joint proprietors. [S185] Property Titles. ; PROV (Public Records Office Victoria), C/T 7966-028 - Henry George Martin died on 25th November 1964. Probate of his will has been granted to Florence Mercy Martin of 54 Centre Dandenong Road Cheltenham Widow and Harry George Martin of Emerald Creek Road Monbulk Florist. [S185] Property Titles. ; PROV (Public Records Office Victoria), C/T 7966-028 + C/T 8078-303 - transfer as to balance - C/T 8748-006. [S185] Property Titles. ; PROV (Public Records Office Victoria), C/T 1123-451 - Thomas Leslie Martin Florist and Gwenda Dorothy Martin Married Woman both of Clarke Road Springvale - joint proprietors. [S80] Ancestry - Family Tree, Martin Family Tree (denisemartin055). [S185] Property Titles. ; PROV (Public Records Office Victoria), C/T 8748-006 - Thomas Leslie Martin Florist and Gwenda Dorothy Martin Married Woman both of Clarke Road Springvale - joint proprietors. [S185] Property Titles. ; PROV (Public Records Office Victoria), C/T 8748-006 - Mortgage to Florence Mercy Martin and Harry George Martin (as Executors of the Will of Henry George Martin deceased) - discharged 29 Apr 1974. [S24] PROV (Public Records Office Victoria), VPRS 24/ P0 unit 1044, item 1923/1142. [S332] UK - General Register Office Indexes "mother MILLS." [S11] Newspaper - Argus 22 Feb 1884, p1. [S34] PROV (Public Records Office Victoria), VPRS 267/ P7 unit 1239, item 1898/256. [S34] PROV (Public Records Office Victoria), VPRS 267/ P7 unit 1318, item 1902/257. [S34] PROV (Public Records Office Victoria), states that age of first attack about 19? [S11] Newspaper - Argus The Argus (Melbourne, Vic. : 1848 - 1957), Wed 24 Oct 1923, p1. VPRS 7591/ P2 unit 757, item 215/387. [S185] Property Titles. ; PROV (Public Records Office Victoria), C/T 2277-291 + 2277-294 - Edward William Aberdeen of 265 Barkly Street East Brunswick Plumber. [S185] Property Titles. ; PROV (Public Records Office Victoria), C/T 2277-291 + 2277-294 - Rebecca Strobridge of Officer Married Woman. [S185] Property Titles. ; PROV (Public Records Office Victoria), C/T 2277-291 + 2277-294 - Discharged 17 Feb 1915. Death-Notice* 13 Nov 1922 SEELEY (formerly Seelenmeyer). On the 10th November (suddenly), Adolphe Frederick, dearly loved husband of A. M. Seeley, of Landcox, North Brighton, aged 67 years. (No flowers, by request.) Psalm 16.11. VPRS 28/P3 unit 2245, item 243/988. [S11] Newspaper - Argus 17 Oct 1887, p1. [S185] Property Titles. ; PROV (Public Records Office Victoria), C/T 1607-348 - Adolphe Frederic Seelenmeyer to David John Davies Bevan of 364 Albert Street East Melbourne Barrister-at-Law. [S11] Newspaper - Argus 13 Nov 1922, p1. [S11] Newspaper - Argus 24 Sep 1875, p1. Death-Notice* 8 Dec 1868 LOVE.-On the 7th inst., at Hawthorn, Elizabeth Campbell, wife of William M'Naughton Love, aged twenty-nine years. THE Friends of WILLIAM McNAUGHTON LOVE, Esq., are respectfully invited to follow the remains of his late wife to the place of interment, in the Melbourne General Cemetery. [S11] Newspaper - Argus 8 Dec 1868, p4 + p8. VPRS 7591/ P2 unit 422, item 107/798. [S185] Property Titles. ; PROV (Public Records Office Victoria), C/T 2424-735 - John Hamilton of Upper Beaconsfield Farmer. [S185] Property Titles. ; PROV (Public Records Office Victoria), C/T 1604-772 - Elizabeth Milne Love to John Hamilton of No 42 Margaret Street Moonee Ponds Tobacco Manufacturer - C/T 2758-427. [S185] Property Titles. ; PROV (Public Records Office Victoria), C/T 2758-427 - John Hamilton to William Riggall and Wilfred Henry Johnston. [S185] Property Titles. ; PROV (Public Records Office Victoria), C/T 2758-427 - John Hamilton to Emma Rhoda Day of Pakington Street Newtown Geelong State School Teacher. [S185] Property Titles. ; PROV (Public Records Office Victoria), C/T 2424-735 - Herbert Landells Vines Moore Street St Kilda Grocer. [S14] Newspaper - Leader (Melbourne), 12 Aug 1899, p11. [S12] Newspaper - South Bourke and Mornington Journal 25 Oct 1905, p3. [S11] Newspaper - Argus 20 Jul 1936, p18. 5-038-B Dickie W. M 62 20/07/1936 956. [S19] Newspaper - Berwick Shire News and Pakenham and Cranbourne Gazette "24 Jan 1917, p2." [S185] Property Titles. ; PROV (Public Records Office Victoria), C/T 3484-651 - Title re-issued see C/T 8337-060 - Worthy Carpenter of Yurnga Old Officer Road Upper Beaconsfield Primary Producer. [S185] Property Titles. ; PROV (Public Records Office Victoria), C/T 8337-060 - John Kogge Fitter and Ingeborg Kogge Married Woman both of Dickie Road Upper Beaconsfield - joint proprietors. [S65] Ancestry - various indices, 1911 census: Class: RG14; Piece: 32288; Schedule Number: 99. [S188] Newspaper - Berwick County Times / The Times "26 Oct 1934."